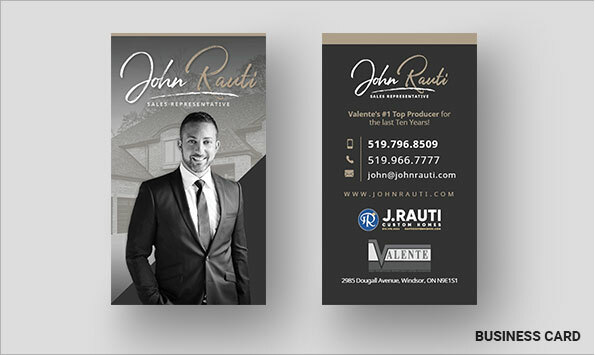 John Rauti is a Sales Representative with Valente Real Estate Ltd. Brokerage with extensive experience in all aspects of new home construction including design, planning and sales. Clients can save money, time and get exactly the new home they want by working with John, and thanks to his close involvement with the builder, he can offer clients great new homes in outstanding locations that other agents may not be able to. John was already an established and successful agent prior to working with Real Estate Solution, but chose us to help bring his business to the next level with a custom agent website, branding and ongoing lead generation services. We started our work with John by designing a unique logo that represents him as an agent. We worked with him to narrow down the exact look and feel he wanted for his logo, and then extended that design to complete brand for John. John’s real estate branding package included yard sign design, business cards and email signature. 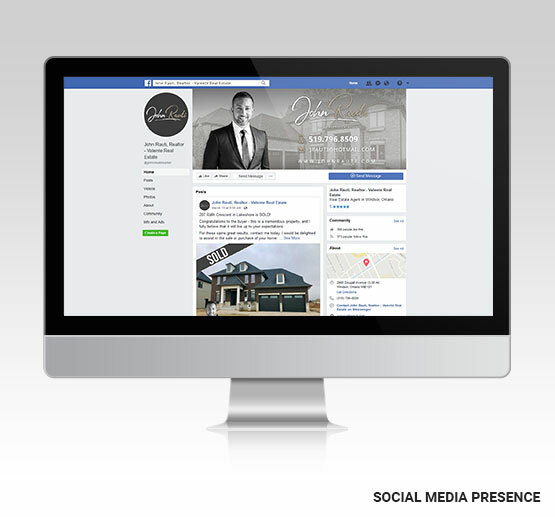 We also designed social media graphics to help John’s new listings and sold properties stand out on Facebook. After designing a complete real estate agent brand for John, we custom designed and developed a website for John. The website we created for John emphasizes how he helps his clients get the right new home in the perfect location, and how John can help them move from their existing home to a new custom home. His website includes custom sections for his new developments and upcoming developments as well as a Real Estate News section to help him spread the word about his new home builds. We continue to work with John to help bring him new leads with ongoing real estate lead generation services. With social media marketing, we advertise John’s new home listings, sold properties and upcoming open houses on Facebook. With Google Ads, we help bring John leads directly through Google search results. We also continue to add new content to John’s website to give visitors a reason to keep coming back and to make sure John’s latest news and information is always available on his website. John is just one of the established real estate agents we have worked with to bring their business to the next level. Whether you’re just starting out in real estate or are an agent or team with a long track record of success, let us help you grow your online presence and real estate brand. To learn more, fill out the form below.